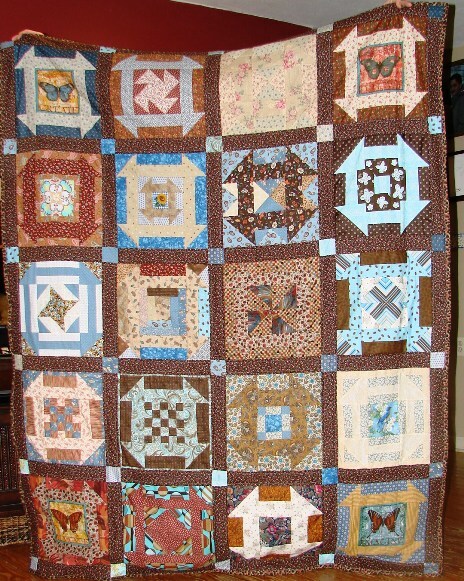 My favorite is the brown quilt, Brown It Is, with blues and in the churn dash pattern. Then there is the Fu logo I made for my son. 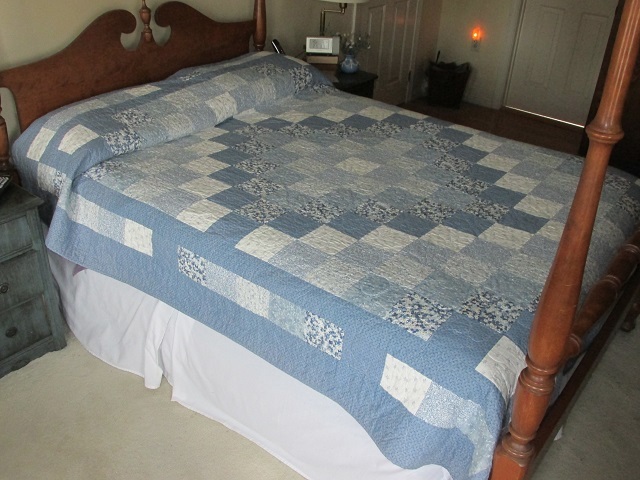 It is queen size, and is scrappy pieced to be the logo he uses for his art. 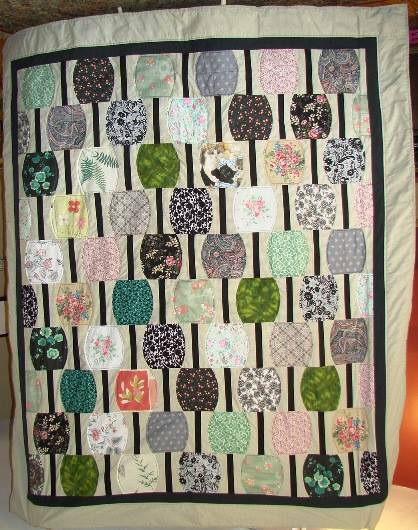 My third favorite is my first time I worked with curves in a quilt for my daughter. I was afraid of the curves but I did it anyway and was proud of how it came out. Sorry, I couldn't choose just one! All are magnificent and I can understand why they are "favorites". The amount of talent on this board is mind-boggling. Great work, everyone. What a wonderful way to spend time on a lazy morning appreciating what others do! My "to do" list has grown incredibly. No truer words were ever said! 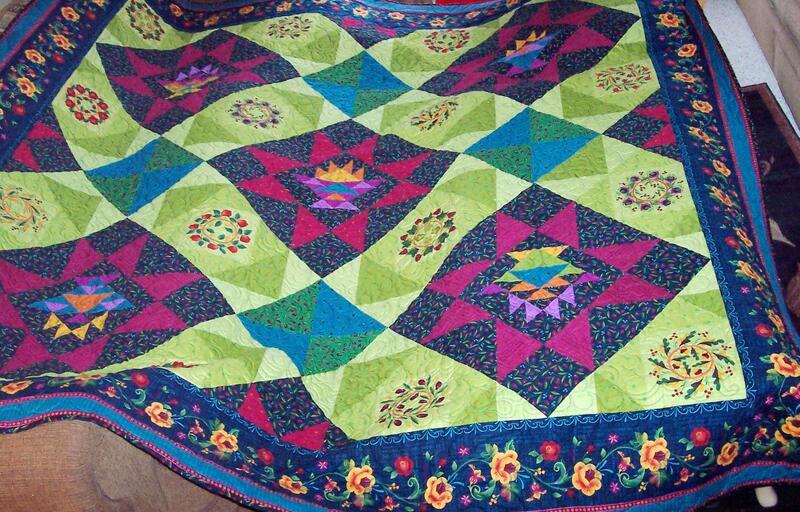 So many beautiful quilts! I especially love to see the ones with all the hand embroidery and applique because I'd never have the patience to do one like that. Thanks, all for sharing the pictures. And thanks, Boston 1954 for starting this thread! gorgeous!! !also looks very well made.Love the color!!! 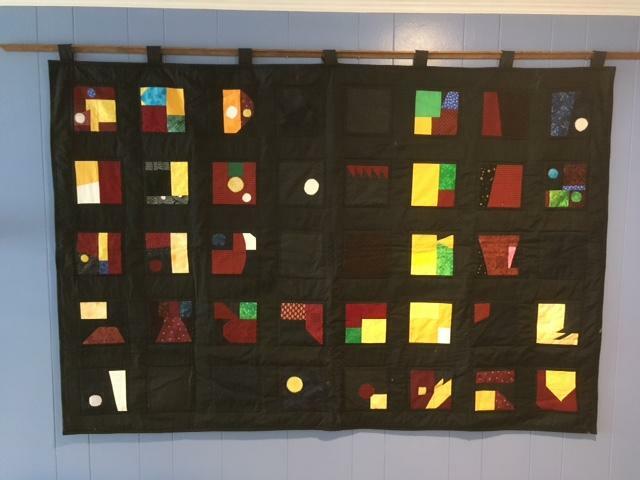 Here is my Cathedral Window quilt. All of these quilts are just beautiful. Thank you for showing us 'the best of the best'. Beautiful Quilt Show, y'all. It's obvious that the favorite quilts of quilters are not the quilts tucked away for safe keeping in the trunks and closets. The favorites are seen and used everyday. Thank for posting, your favorites. I don't know if I have a favorite. The closest is this one, that hangs above the couch. I tried to swap it out once and my husband and son won't let me. Loving all the different quilts. This is my favorite quilt. My goodness, I had no idea that there would be so many....and all gorgeous! Thanks so much for all the stories, and pictures. I so love this! It is wonderful! Show me a picture of your favorite. Now this is not the one that was the easiest, or the one that took the least amount of time. It may be the opposite. The one that was a struggle for maybe two years, but when it was done, you stood back and thought "Look what I have done!". What one has given you the most satisfaction of all. I want to see it. 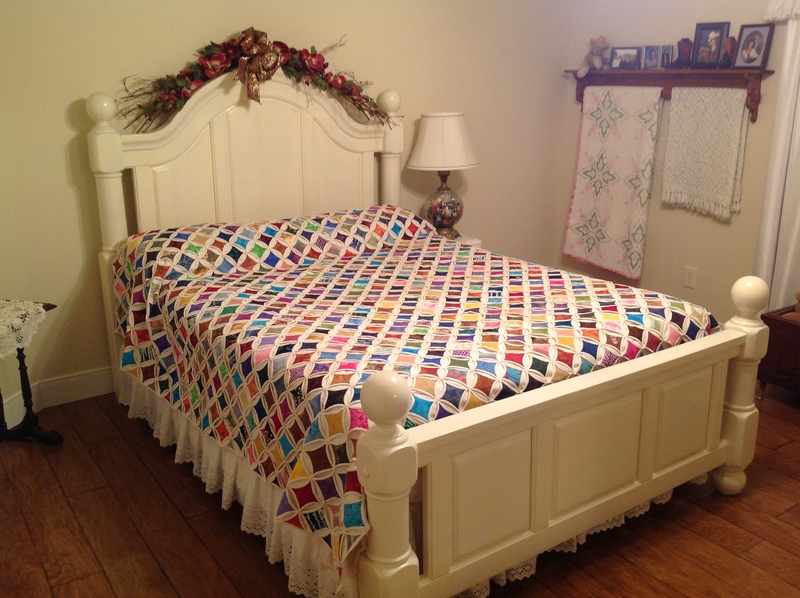 So glad you did this post...I have sure enjoyed seeing the quilts. I think that this is my favourite quilt. I found most of it in a charity shop, a couple of the blocks half completed, and most of the fabric in different areas of the shop. I completed it as a QAYG, and gave it to my sister. And you did a wonderful job on it! That's a beautiful first quilt! This is my fav to date... my most artistic, too. I'm making this one now. It really goes fast! All the quilts are magnificent! This is my favorite. It was the biggest one I had attempted, the most time consuming and challenging, made for my sister's 50th birthday, to use in her log cabin. I designed horse-head medallions by freehanding the profiles on a paper plate, and figuring out how to quilt it using multiple motifs instead of just staying "safe" with what I felt comfortable. 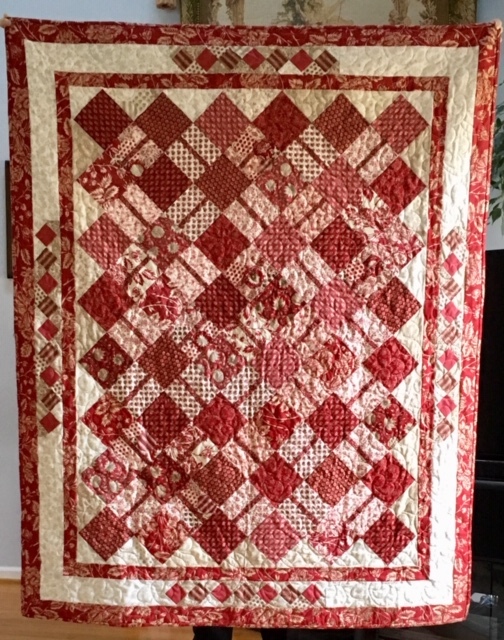 I figured if she could handle a 7-acre farm, animals, new job, and a new house all by herself, surely I could try new things with my quilting. My sister had moved all her belongings, horses, dogs, and cats after a nasty divorce and began life anew . She knew that God had provided everything for her transition, including her unexpected dream home. 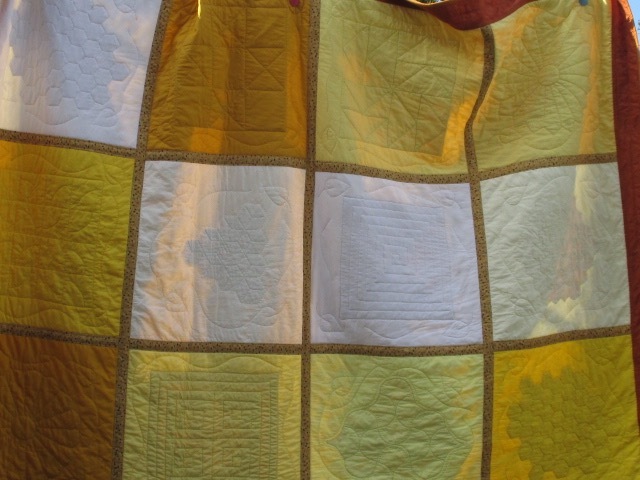 I named this quilt "Providence Lodge"--and she loves it every day. PS This photo was before I washed out the marking lines. Last edited by zozee; 02-12-2019 at 09:19 AM. How fun this thread is! 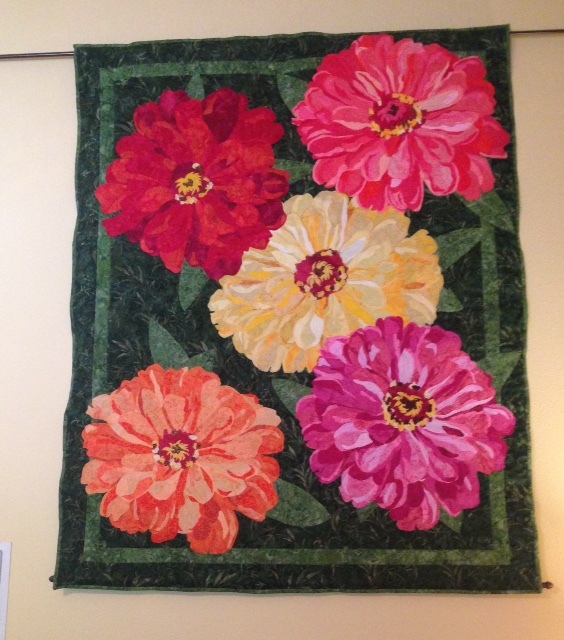 I have really enjoyed seeing all of the beautiful quilts. Thanks for sharing ladies. My favorite quilts are these two. Both gifts to family. Last edited by RedGarnet222; 02-12-2019 at 11:12 AM. Red- those are simply amazing!!!!!!!! 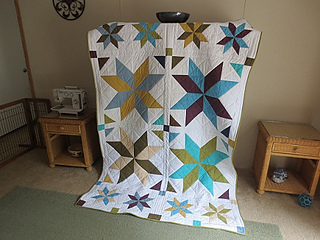 RedGarnet222, I totally love your quilts but especially the turquoise and black one. 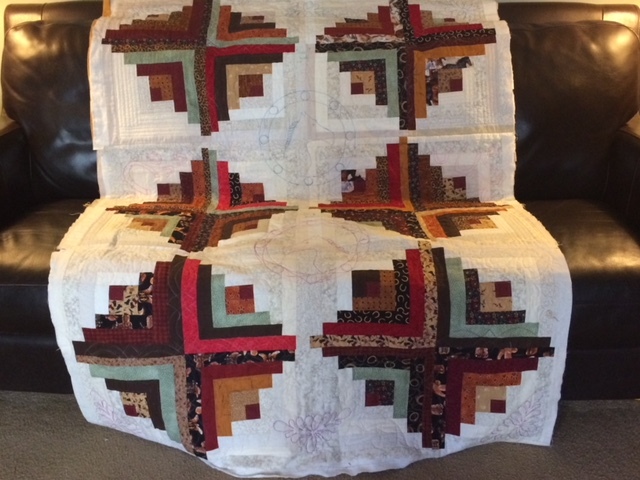 Is this an original or can you share the pattern name? I really want to try this when I get a chance. Thanks girls! I loved making them The first one was a block of the month at Going Batty quilt store. and the second one is a free pattern by Red Rooster fabrics at their site. It is called Rhythm and Blues. I bought the fabrics on line. This was some years ago, so I don't know if you could find the exact fabrics now. But, who knows? I am thinking it would be in the archive quilt pattern section of the free quilt patterns. 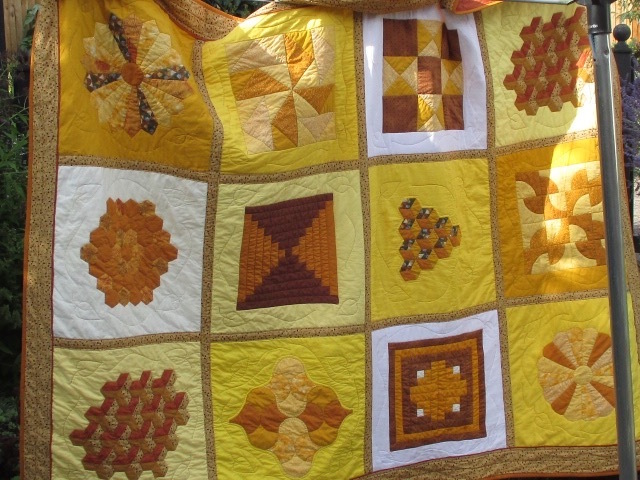 I loved making that quilt and thought about remaking it in a yellow and black version. There are some pretty amazing patterns on their site. By the way, I made dotty (here on the board) a sewing kit up in the last leftover fabrics. I posted the pieces here on the board. It was a really nice fabric line and I loved working with it. Last edited by RedGarnet222; 02-12-2019 at 04:21 PM. Found the sewing set... Here is a link. I looked for the site to post a link for you and I couldn't find it anywhere. I am wondering if they took the site down. If you want a copy of the pattern, pm me. I think I can find it to copy it for you wildyard.